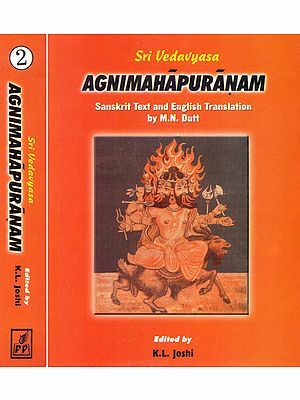 The present volume contains the Agni Purana Part I (Chapters 1-100) in English Translation. This is the twenty-seventh Volume in the Series on Ancient Indian Tradition and Mythology. The project of the Series was envisaged and planned in 1970 by Lala Sundar Lal Jam of Messrs Motilal Banarsidass. Hitherto twenty six volumes of the Series (comprising English translation of Siva, Linga, Bhagavata, Garuda, Narada, Kurma and Brahmanda Puranas) have been published and released for sale. The present Purãna, like all other Purãnas is of encyclopedic character. The early chapters which open this Part describe glories of lord Viz in his different forms. There are legends of Viz as Fish saving Manu from drowning in the Cosmic Flood, as Tortoise supporting Mount Mandara at the churning of the ocean, as Boar slaying Daitya Hirayaka, as Man-lion killing Hirayakasa, as Dwarf cheating Bali, as Paraurama destroying Katriya rulers, as Rama assassinating Rãvaa, as Kra beheading Kathsa, as Buddha preaching the gospel of meditation, as Kalki to slay Mlecchas. Going ahead, we find that a considerable portion of this Part deals with the Tantrika ritual for the installation and consecration of images of Visnu, Siva and other deities in their respective temples. A number of chapters relate to the initiation of a novice to the cult and the rites of initiation. The rites are described in detail. They are interspersed with the mystic syllables of Tantras which impart efficacy to the ritual concerned. A number of chapters throw light on the characteristics of images, mode of their installation and worship. Scattered here and there are the chapters on creation, on purification of oneself and others, on the positions of fingers (mudras) in worship and on scores of other topics with details not found in other Puränas. As to the date of this Purana, nothing can be said with certainty. It being a compilation from various works written in different periods, no single date can be assigned to the Purana as a whole. But, what is certain is the fact that a number of sections were written long before the Mahommedan invasion. For instance chapter on archery and arms civil administration and military discipline are purely of Hindu character and can claim antiquity. Chapters on medicine and grammar are also old. Summaries of the Ramayana and Mahabharata indicate that the sections were written when Hinduism was in flourishing condition and the epic tradition had become sacred. Sections on avataras on polity and judicature on genealogy and history of ancient kings and distinguished personages also belong to pretty olden times. Sections on religions are also old as they seem to have been written when there was no rift among various sects. But the Purana contains sections which are obviously later in date. For instance a considerable number of chapters which deal with the mystic rules, mantras and ceremonies cannot claim antiquity. They might have been written after the Tantric form of worship had become popular in India. According to the definition of the grammarian Panini the etymologist Yaska and the Puranas themselves the word purana is that which is existing from long time past. Itihasapurana is held as the fifth Veda in the Chandogyopanisad. The Vedas do not use the word. Purana as referring to the class of literature now known as the Puranas. The Brhamanas refer to the practice of recitation of the Puranas at the sacrifices. The plural usage puranani in the Taitiriya aranyaka leads us to infer that during the day of the Aranyakas of Valmiki refers to the class of literature known as Purans. According to Mahabharata the itihasapurana had to be used as supplement to Vedas. It also declares that the veda is afraid that men of little learning would misinterpret it. The arthasastra of Kautilya names the atharvadeda and Itihasa as Vedas and naming the three Vedas Rg, Yajus and saman. According to a tradition found in Skanda Padma and Matsya puranas the Puranas were one single literary piece consisting of the three topics dharma artha and kama. From the Nyayasutrabhasya of Vatsyayana we find that the following three broad divisions of the literature existed (1) the Vedas consisting of the formulae for sacrificial rites and rules relating to them (2) the Itihasa and Purana dealing with history of world or people and dealing with the history of world or people and (3) the Dharmasastra for the determination of punya and papa in the world. It seems the last section was also incorporated in the Puranas in C.5th or 6th century A.D.. The Puranas hold identical views regarding the origin of the Puranas from the mouth of Brahma the only point of difference is regarding the time of their origin either before or later to the Vedas while the Vedas came out of Brahma in order the Puranas came out at the same time. The Puranas are unanimous in their view that Vyasa made the Puranasamhita and instructed his pupil Lomaharsana whom he entrusted the work of spreading it. This is considered to have been at a time when the Vedas were divided into four. Vedavyasa who had the knowledge of the Puranas is said to have composed the Pranasamhita based on the akhyana, Upakhyana and gatha etc. while the akhyana is the narration about an incident which the speaker himself has witnessed the upakhyana is that which was heard somebody and retold. Gathas are the metrical quotations found in the Vedas Brahmanas etc. We also find a traditional definition in some of the Puranas according to which a Purana should comprise the five topics namely (1) the primary creation (2) the secondary creation (3) the genealogy of gods and sages (4) the periods of Manu and (5) the accounts of royal genelogy. While some of the Puranas satisfy this definition most of them do not. Almost all the Puranas contain either briefly or in detail these topics. The first topic Sarga concerns with the creation of the categories divided into three groups Prakrta, Vaikrta and Ubhayatmaka. The first group consist of the following (1) mahat (2) ahankara (3) Bhutatamatras (4) indriya (Jnana and kriya) (5) manas (6) tamas (tamisra, andhatamisra, tamas, moha and mahamoha). The second group consists of (1) urdhvasrotaks (higher orders) (2) tiryaksrotas (lower orders) and (3) arvaksrokas (middle orders). The last group consists of Kaumara sarga creation of sanaka, Sanandana, Sanatana and Sanata kumara. The second topics namely the pratisarga, describes the different kinds of pralaya naimitika, prakrtika, nitya and atantika, the naimititika is that which takes place at the end of Brahma’s one day i.e. a kalpa. It lasts during the period of Brahma’s night. The prakrtika is that in which the seven prakrtis (mahat ahankara and the five tanmatras) merge in that one which was the cause of their origin at the end of parardha (fifty years) of Brahma’s life. The nitya is that which takes place every day during the night when all being go to sleep. The atyantika takes place at the end of hundred years of Brahma’s life. The third one the vamsa is that which gives an account of the genealogy of the kings and sages belonging to the past present and future rajnam brahmaprasutanam vam sastraikaliko nva yah. The fourth one the manavantara gives the names of Manus their periods the names of sages Indra etc. (manvantaram manurdeva manuputrah surevarah rsayo msavatarasca hareh sadvidhamucyate. The fifth one the vamsanucaria describes the lives of great sages and kings born in particular lineage (vamsamcaritam tesam vrttam vamsadharasca ye. However these topics are very meagerly represented in most of the Puranas. The above subjects are dealt with in a comparatively abridged form in Agni P. and Gar, P. and paraphrased in vi.P there are only three cases of complete description of these five topics in the Purana literature namely in the Brahma P, Brahmanda P, Vay. P and Mat P. pargiter opined that there was one complete harmonious account from which others were reproduced. Almost all the Puranas have a sectarian character according to the cult of the deity they adhere to. This gave rise to new definitions for the Puranas. According to the Brahmavaivarta the five characteristics. The Bhagavata also prescribe ten characteristics for a purana. There are creation details of creation duties of sentient beings protection of devotees ages of manu, dynastics of kings and sages, career of individuals dissolution of the world cause of creation and Brahma. The Matsyapurana adds in addition to the above ten characteristics the following characteristics also the glorification of Brahma, Visnu, Surya and Rudra, dissolution and preservation of the world and the four purusarthas. The Jayamasngala a commentary on the Arthasastra of Kautilya quotes a verse from some old work giving a new set of five topics such as the creation existence destruction the pursuit of righteousness and liberation for a Purana. This Purana, like most of the other Purãnas, is of encyclopedic character. Like the first part, this part of the Agni Purana contains topics of diverse nature. Nevertheless, there is unity under diversity. For example, Chapters 101-106 which open this part deal with the subject of architecture in relation to temple edifice, house-building and town-planning. Ch. 107-l08 describe Svayambhuva creation and the Cosmographical account of the Universe. Chs. 109-116 deal with the sacred places of pilgrimage on the Ganges and Narmada as well as on the Srisaila mountain. Among the holy places, Vãränasi, Pukara, Kuruksetra, Rajagiha, Prayaga and Gaya figure prominently. Ch. 117 describes the mode of performing ancestral rites at these places. Chs. 118 to 120 are devoted to the description of Continents with special reference to Bharata, the sub-continent of Jambudvipa. Chs. 121 to 149 relate to astrology and astronomy in relation to war. They also outline a number of stratagems and tantric rites for running administration and gaining victory in war. From the study of these and other chapters on polity it appears that the statesman of the Agnipurana is in favor of Imperial power to be vested in the Sovereign who is ambitious for world conquest. The ambitious monarch is asked to seek success from all quarters, specially from super powers such as Kubjika, Camucda, Aghorã and Varadê, these being the various forms of goddess Sivà, the consort of Lord Siva. From these topics the Agnipurana proceeds to the description of Manvantaras (giving names of Manus, sages, Indra for each cycle of Manu), Asramas (Stages of life), Samskaras (Purificatory rites) from birth to death (150-167) Ch. 168 to 174 relate to atonements for various offences and expiations for sins. Chs. 175 to 207 describe religious vows – obligatory and occasional some of which are not found in the Smrtigranthas. Chs. 208-213 dewell upon gifts and corporeal auteristies (Vratas) of pious nature. Ch. 214 describes the system of veins in the body and their functions. Chs. 218 to 237 constitute discourse of Puskara to Vaistha on the king’s coronation. Appointment of assistants and the code of their conduct fortification, kings duties policy, code of law, military expedition omens presaging victory or defeat in war six expedients rites preceding the march of the army and a hymn to Lakshmi for success. Chs. 238 to 242 include Rama’s discourse to Laksmana on the eve of battle in Lanka on the duties of the monarch six expedients and four ways of policy and a harangue on king’s statesmanship. From these topics the Agnipurana proceeds to some miscellaneous topics such as the description of physiognomy of men and women royal fan, bow and sword (245) testing of gems (246) site for building (247) worship of Visnu (248) science of archery and the method of using a noose (249-251). This wide range of subjects is most interesting and informative the treatment of each topic comprising one or more chapters is lucid and unitary in expression and thought. The agni Purana like most of the other Puranas is of an encyclopaedic character. Like the first two parts also contains topics of diverse nature as a glance through the contents will show. 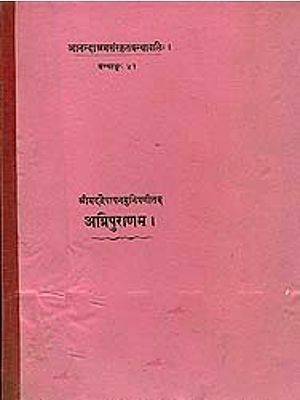 They include the art of settlement of civil disputes and criminal proceedings against offenders the use of Vedic hymns for accomplishing specific secular and religious purposes, observances for averting bad effects of portents and planets modes of worshipping various deities, description of the recessions of the Vedas merits accruing from making gifts of Puranas etc. several chapters are devoted to the description of Solar, Lunar and other royal dynasties. There is a lot of material of medial interest. In addition to human diseases and their treatment are also discussed and remedies prescribed for their cure. Different kinds of snakes medical treatment for their bites the use of herbs and incantations to remove this poison are taken up at length. In brief the reader will find a wide range of interesting and useful material therein. It is our pleasant duty to put on record our sincere thanks to Dr. R.N. Dandekar and the UNESCO authorities for their kind encouragement and valuable help which render this work more useful than it would otherwise have been. We are extremely grateful to Dr. Gangadharana of the Sanskrit Department University of Madras for his lucid translation of the text. We also thank all those who have been helpful in our project. This thirtieth volume in the series on Ancient Indian Tradition and Mythology forms the fourth and last past of the Agni Purana. It contains the English translation of chapters 312-383. The project of this series was envisaged in 1970 by the late Lala Sundar Lal Jain of Messers Motilal Banarsidass. Thirty six volumes of the series including the present one have so far been published and others are in progress. With the release of this volume complete sets of the translation of ten Mahapuranas, Viz, Agni Bhagavata, Brahma Brahmanda, Garuda, Kurma Linga, Narada, Siva and Varatha are now available to the interested readers. Two attractive and very useful features of this part of the Agni Purana are (1) a new Introduction supplementing the one added to Part I and giving additional information about the subject matter discussed in the various chapters of the Purana and its salient points and thus rendering superfluous any attempt to give a summary of the contents of the present Part here and (2) also a detailed Index covering all the four parts of the Purana.